After organising a ticket giveaway back in March at the start of the tour, I was impatient to see Story Pocket’s version of Arabian Nights. When the show played at Edinburgh Fringe Festival 2014 it received the Primary Times Children’s Choice Award – and for its first ever show – what a great start. My winner of the giveaway and her family had really enjoyed the show, plus the company’s patron is Michael Morpurgo. I couldn’t wait to see if it lived up to expectations. You can tell a lot by the name of this theatre company. Story Pocket Theatre is all about storytelling, and their first choice of show is apt. 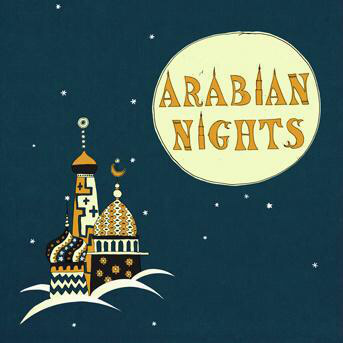 Arabian Nights (otherwise known as One Thousand and One Nights) is a collection of ancient folk tales set in West and South Asia and first told in Arabic in the 15th and 16th centuries. It uses the framing technique, in other words the story within the story, or in this case up to a thousand and one stories within the story! Story Pocket Theatre has chosen some of the best child-friendly tales for its engaging adaptation. The ‘outer story’ is that of Sheherazade, who has married a very suspicious king who has previously killed each of his wives before one day is up (to avoid them being unfaithful to him). The clever Sheherazade uses her entertaining tales to keep the king enthralled (and her alive) into each following day, and it is this device which means we hear a succession of magical stories and adventures. Some of the well-known tales include Aladdin and his lamp, Ali Baba and the Forty Thieves, and The Fisherman and the Genie. The versatile cast of 3, William Forde, Yasmin Goodwin and Luke Pitman, take on every character with gusto and fun. They use minimal wardrobe, a couple of genies’ lamps, a great selection of headwear, and just a few props including what looks like a massive lit-up garlic bulb that opens and closes to form Ali Baba’s cave (‘open sesame!’). They use physical comedy, puppets, they go cross-eyed, they dance and sing, they play 40 thieves between them, and they are basically a brilliant team to watch for an hour. In fact I could have enjoyed hearing many more of the 1001 stories (though I don’t believe they would all be appropriate for this audience). We had personally had a difficult time getting there. I won’t bore you with the details but they included some Wotsits and a downward tube escalator in not the most positive terms, and it seemed very unlikely that we would make it to the show on time. Finally finding the Blue Room in the Royal Festival Hall, on a packed weekend for the Alchemy Festival, we snuck in a few minutes late… and the children turned into a rapt state almost instantly. The atmosphere of the show and the enthusiasm of the actors meant that our last stressful half hour was forgotten and we were transported to Arabian places, and directly into tales of princesses, genies and peasant boys. But does it have a happy ending? There are a few tour dates left, so check the website here for tour dates and if there is a show on near you, I urge you to go and find out! Afterwards, due to the earlier incident and the subsequent painful hobbling, we didn’t stay to meet the cast members, but it was lovely to note that they stayed for photographs with the audience. The show comes highly recommended and we are already looking forward to whatever their next one may be. Disclaimer: We were given free tickets to see Arabian Nights for the purpose of this review. All opinions are my own. The photos are copyright of Story Pocket Theatre. For more details, see the Story Pocket Theatre website. Posted in Kids, Reviews, TheatreTagged Arabian Nights, kids theatre, Sheherazade, Southbank Centre, Story Pocket Theatre, storytellingBookmark the permalink.